The CSS2.1 border property has served us well but it’s a little basic. What if you require two or more borders in different colors? The CSS3 border-image property is an option but it still requires Photoshopping shenanigans and the syntax is quite complex. However, if you simply need a series of solid-color borders, there is an easier alternative: the box-shadow property. inset: (optional) if defined, the shadow will appear inside the element. The effect works in all the latest browsers including IE9. It can be combined with border-radius but remember that the radius is applied to the inner element so the outer shadows extrude accordingly. 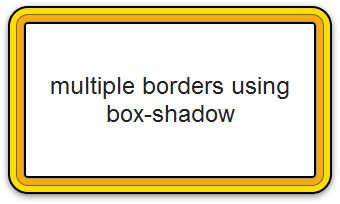 Unlike a real border, box-shadow does not require space so the effect will flow under other elements. Some will consider it a hack, but it’s an quick solution for multiple borders which doesn’t require images.